NEW: Read the project report! ​This report seeks to identify the training needs of beneficiaries of international protection in Malta and to map out the existing mechanisms for training provision, in order to better facilitate the integration of beneficiaries of international protection and asylum seekers (especially women) in society, by increasing skills and training in cultural, linguistic and various other aspects. It is important to note that this report will not focus on legal and procedural information regarding the asylum process but on integration-related information and training. Project Partners: Hellenic Foundation of Europe & Foreign Policy (Greece), MELISSA: Network of Migrant Women in Greece (Greece), Centre for Social Studies and Policies (Italy), Comissio Catalana d’Ajuda al Refugiat (Spain), The People for Change Foundation (Malta), Cooperation for Voluntary Service (Bulgaria). Migrant women face multiple disadvantages in accessing vocational training, linguistic support and other lifelong learning opportunities. In economically booming Malta, a recent survey shows that the majority of migrant women cannot find employment, and those who are employed lack formal contracts. This relates not only to discrimination, but also to the specific sectors where migrant women tend to find employment. To address these gaps, this project builds on the findings of the EU-funded project ASSESS: Assessing the Integration of Vulnerable Migrant Groups, regarding the gaps and good practices in the integration of vulnerable migrant groups and in particular, migrant women. In view of the findings of that project the main objective of INTEGRA-TRAIN is to foster the integration of migrant women trough the design and piloting of comprehensive integration training. Facilitate familiarisation with the social, legal, political, and cultural environment of participating States to foster integration policies for the long term. To offer recommendations about how to best address these gaps. The current global refugee crisis has highlighted a lack of infrastructure that aides in integrating migrants into European societies. With more than 75,000 arrivals in Europe from January-June 2017 (according to the United Nations High Commissioner for Refugees), existing labour market structures are challenged to absorb migrant potential. Lack of networks and social capital are cited among the main reasons for unemployment and underemployment among migrants, especially asylum seekers and beneficiaries of international protection. Even when integration policies and strategies are in place, they are not without gaps. International protection seekers often have their qualifications dismissed, and crowd into underpaid and heavily gender-segregated sectors. In Malta, there are policies meant to aide in integration, but a comprehensive integration strategy is still being developed. A lack of dedicated resources and political will is making integration for international protection seekers difficult – despite labour shortages in the Maltese economy. Some of the gaps are filled by NGOs, but there is a need to map out these efforts to reduce duplication and to raise awareness of the opportunities available in various localities in Malta. Friday 9 November: Today we set out on another course of training on migrant integration this time in collaboration with the Migrant Women Association Malta. This course will run in two parallel streams in order to reach more people. Saturday 6th of October: the first integration course has commenced in collaboration with the African Media Association. The course, which builds on months of preparation through research, drafting and discussion with relevant stakeholders will run for 8 weeks providing participants a rounded overview of Malta, Maltese society and their rights living in Malta. November 29th to December 1st 2017 Representatives from The People for Change Foundation participated in Training of Trainers in Sofia, Bulgaria as part of the Integra-Train Project. 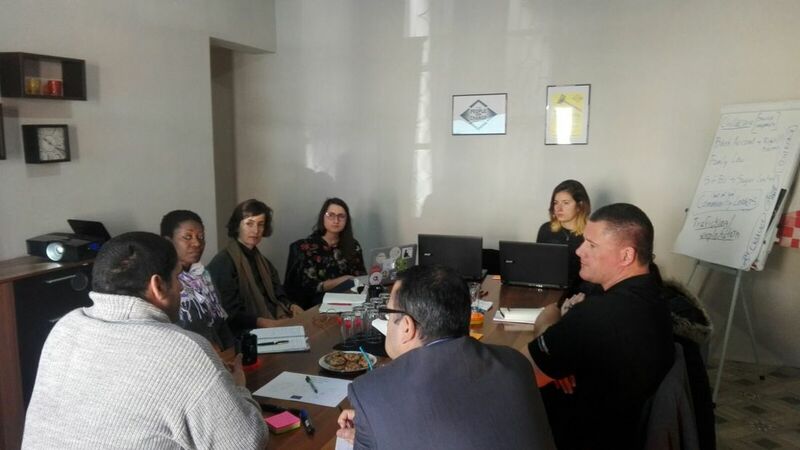 The meeting provided an opportunity to discuss the orientation and training sessions that the project partners will be developing over the course of 2018, another opportunity to learn from the Italian and Spanish experiences and visits to a number of reception and integration institutions in Bulgaria. PfC also presented its initial brainstorming on the sessions including what to includes and the value of these sessions within the local context. July 12th to July 14th 2017 The People for Change Foundation participated in an international seminar in Barcelona, Spain organised within the Integra-Train Project. The delegation from Malta included representatives from PfC, Migrant Women Association, African Media Association and the University of Malta. The study visit included an international seminar covering the national and regional reception and integration programmes, the sharing of good practices from a number of city councils, visits to reception centres and integration programmes a training workshop on sessions provided by relevant institutions to migrants and refugees and discussions with local NGOs. May 16th to May 19th 2017 The People for Change Foundation has participated in a study visit in Rome organised as part of the Integra-Train Project. The delegation sent by The People for Change Foundation included representatives from PfC, Migrant Women Association Malta, the President’s Foundation for the Wellbeing of Society and the Valletta Local Council. The itinerary of the visit included visits to reception centres, training centres and a broad range of institutions and organisations working in the field of reception and integration. During the visit, the delegates also participated in an International Seminar on the National Reception System of Refugees and Asylum Seekers.